RAINBOW Beach has always been an adrenaline junkies' Mecca but now a new extreme sport is emerging - sand boarding. An unknown thrill seeker was showing his style on top of the sand dunes above Mudlo Rocks on Saturday, pulling off some amazing aerial moves. While kids slid down the 50m high dunes on boogie boards and pieces of cardboard, the extreme sand boarder readied himself. Kitted up with goggles, gloves and a cut-off foam surf board, he ran down the dune to gather speed before jumping on the board. 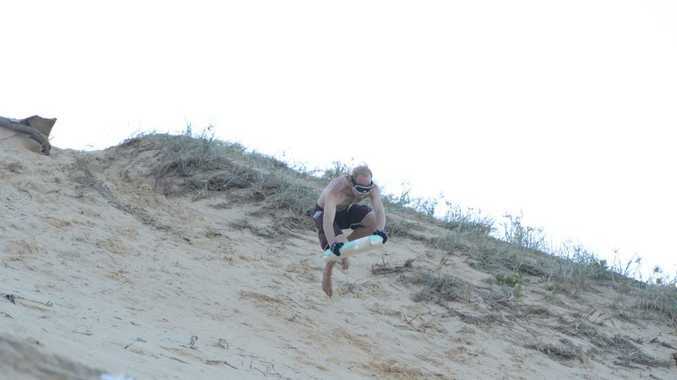 The boarder looked like a cross between superman and a leaping frog as he flew into the air above the dune. As he neared the ground he pulled the board back under his knees to try and execute a perfect landing before crashing and tumbling down the sand hill.